but they seem to not take the uncertainty of the random effects into account. Here's a specific example. I am racing gold fish. I have data on the past 100 races. I want to predict the 101st, taking into account uncertainty of my RE estimates, and FE estimates. I am including a random intercept for fish (there are 10 different fish), and fixed effect for weight (less heavy fish are quicker). Fish D has really let himself go (1.11 oz) and is actually predicted to lose to Fish E and Fish F, both of whom he has been better than in the past. However, now I want to be able to say, "Fish E (weighing 0.91oz) will beat Fish D (weighing 1.11oz) with probability p." Is there a way to make such a statement using lme4? I want my probability p to take into account my uncertainty in both the fixed effect, and the random effect. PS looking at the predict.merMod documentation, it suggests "There is no option for computing standard errors of predictions because it is difficult to define an efficient method that incorporates uncertainty in the variance parameters; we recommend bootMer for this task," but by golly, I cannot see how to use bootMer to do this. It seems bootMer would be used to get bootstrapped confidence intervals for parameter estimates, but I could be wrong. OK, I think I was asking the wrong question. I want to be able to say, "Fish A, weighing w oz, will have a race time that is (lcl, ucl) 90% of the time." This seems to actually be centered around the population average? As if it's not taking the FishID effect into account? I thought maybe it was a sample size issue, but when I bumped the number of observed races from 100 to 10000, I still get similar results. 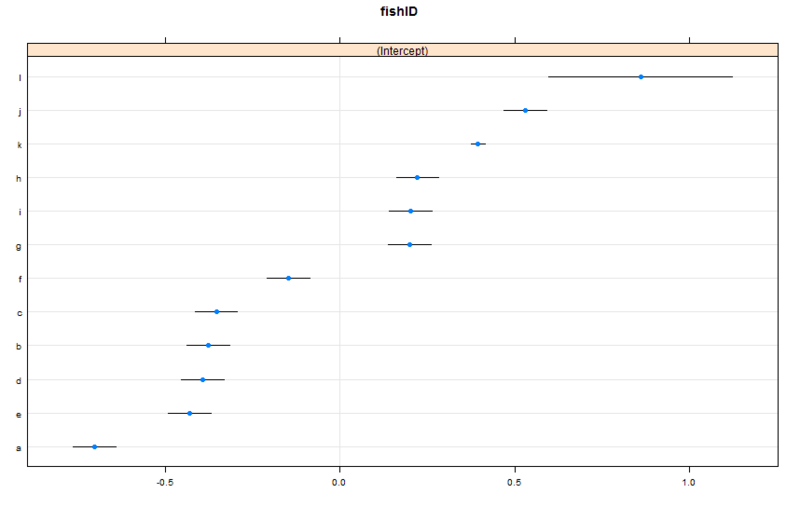 That interval is too narrow, and would seem to be a confidence interval for Fish A's mean time. I want a confidence interval for Fish A's observed race time, not his average race time. How can I get that? I thought I found what I was looking for in Gelman and Hill (2007) , page 273. Need to utilize the arm package. Actually, this probably isn't exactly what I want. I'm only taking into account the overall model uncertainty. In a situation where I have, say, 5 observed races for Fish K and 1000 observed races for Fish L, I think the uncertainty associated with my prediction for Fish K should be much larger than the uncertainty associated with my prediction for Fish L.
Will look further into Gelman and Hill 2007. I feel I may end up having to switch to BUGS (or Stan). 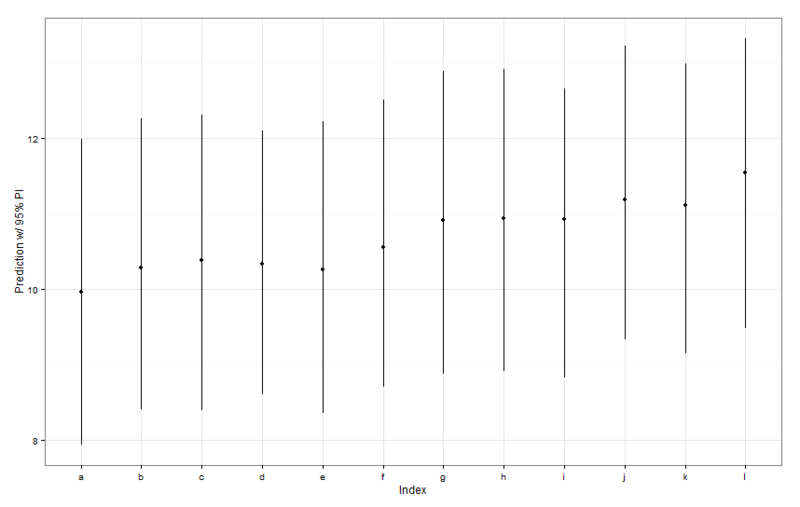 All of those prediction intervals appear to be identical in width. Why isn't our prediction for Fish K narrower the others? Why isn't our prediction for Fish L wider than others? This question and excellent exchange was the impetus for creating the predictInterval function in the merTools package. bootMer is the way to go, but for some problems it is not feasible computationally to generate bootstrapped refits of the whole model (in cases where the model is large). You can specify a whole host of other values to predictInterval including setting the interval for the prediction intervals, choosing whether to report the mean or median of the distribution, and choosing whether or not to include the residual variance from the model. It's not a full prediction interval because the variability of the theta parameters in the lmer object are not included, but all of the other variation is captured through this method, giving a pretty decent approximation. The output of bootMer is in a not-terribly-transparent "boot" object, but we can get the raw predictions out of the $t component. How much of the time does Fish E beat Fish D? Not the answer you're looking for? Browse other questions tagged r mixed-model prediction prediction-interval lme4-nlme or ask your own question. Recommendation: Fast algorithm for logistic random effects?